. 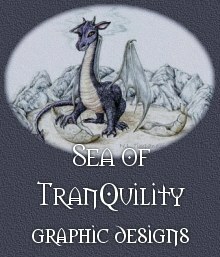 :Sea of Tranquility Graphic Designs:. Aphrodite Ancient Greek goddess of love & beauty. Beaujolais French wine-growing region; also a wine from this region. Bella Luna Italian, "beautiful moon"
Benu A heron-like bird; one of the forms taken by the Egyptian sun god Ra. Later linked by the Greeks to their phoenix. By the Time We Got to Woodstock A song about a rock concert which supposedly "defined a generation". Calypso Greek mythology: a sea nymph who detained Odysseus for 7 years. Equinoxes The time when the sun crosses the plane of the earth's equator, making night & day of approximately equal length all over the earth. Vernal Equinox occurs about 21 March and Autumnal Equinox occurs about 22 September. Gawain One of King Arthur's knights of the Round Table. Greenoge Gaelic: a verdant green location. Intertidal Zone Along the shoreline, the area which lies between the low-water & high-tide marks. Lorelei An old sea-farers' name for mermaids, who entice sailors near dangerous shoals, or to linger on foreign shores far from home. Luma Luma From Australian aboriginal mythology; the giant Luma Luma turned himself into a whale and crossed the sea, eventually meeting the Gunwinggu people and teaching them painting and dancing skills. Lung Wang (or Long Wang) Chinese dragon kings, usually considered gods of rivers and lakes. When angry, the Lung Wang were said to bring fogs and earthquakes. Mnemonic II Pertaining to the memory, or a memory assistant. Narcissus In Greek mythology, a handsome youth who fell in love with his own reflection in a pool of water & was enamored to the point of death; after his death, the gods turned him into a flower which bears the name. Niamh (pron. "neeve") An old Irish feminine name meaning 'bright'. In Irish mythology, Niamh was the princess of the Land of Promise. She eloped with Ossian, son of Finn MacCool, and departed for the Otherworld. No Commitment "Non sum paratus me committere." A tongue-in-cheek rendering of Latin, which could be translated as "I'm not ready to make a commitment". You could use the phrase to end a relationship, perhaps? Orion's Belt A string of bright stars which make up the 'belt' of the constellation Orion, the Hunter. Quicksilver An older name for the element mercury, aptly describing the appearance and action of the liquid metal. Sanguine Reddish or ruddy; blood-red; cheerfully optimistic. Sorcha An early Irish feminine name, later Anglicized as Sarah, but now seen in its original form occasionally. Stigmata Marks said to resemble the wounds of the crucified body of Christ, Jesus. Graphics this page © N.L.Timpanelli. All rights reserved.